The base class for all internal data representations. The internal::DataSource is an object containing Data of any type. It's interface is designed for dynamic build-up and destruction of these objects and allowing Commands, Properties etc to use them as 'storage' devices which have the dual copy() /clone() semantics (which is heavily used by the Orocos type and scripting Infrastructure). internal::DataSource's are reference counted and must be allocated on the heap. Use DataSourceBase::shared_ptr or internal::DataSource<T>::shared_ptr to deal with cleanup of allocated DataSources. You are not allowed to delete a DataSource. If you must have the pointer of a internal::DataSource, use the .get() method of the shared_ptr class. Once a newly created internal::DataSource is assigned to a shared_ptr, it will be deleted when that pointer goes out of scope and is not shared by other shared_ptr objects. Definition at line 76 of file DataSourceBase.hpp. You are not allowed to delete this class RTT_API yourself, use a shared pointer ! Definition at line 83 of file DataSource.cpp. Implemented in RTT::internal::NArityDataSource< function >, RTT::internal::UnaryDataSource< function >, RTT::internal::BinaryDataSource< function >, RTT::internal::ActionAliasAssignableDataSource< T >, RTT::internal::ActionAliasDataSource< T >, RTT::internal::LateConstReferenceDataSource< T >, RTT::internal::LateConstReferenceDataSource< A >, RTT::internal::FusedMCollectDataSource< Signature >, RTT::internal::LateReferenceDataSource< T >, RTT::internal::LateReferenceDataSource< ds_type >, RTT::internal::ArrayDataSource< T >, RTT::internal::FusedMSendDataSource< Signature >, RTT::internal::FusedMCallDataSource< Signature >, RTT::internal::AliasDataSource< T >, RTT::internal::ReferenceDataSource< T >, RTT::internal::ReferenceDataSource< ds_type >, RTT::internal::AssignableDataSource< T >, RTT::internal::AssignableDataSource< ProgramInterfacePtr >, RTT::internal::AssignableDataSource< DataSourceType >, RTT::internal::AssignableDataSource< types::carray< T > >, RTT::internal::AssignableDataSource< remove_cr< boost::function_traits< Signature >::result_type >::type >, RTT::internal::AssignableDataSource< ds_type >, RTT::internal::AssignableDataSource< value_t >, RTT::internal::AssignableDataSource< ProgramInterface * >, RTT::internal::AssignableDataSource< bool >, RTT::internal::AssignableDataSource< StateMachinePtr >, RTT::corba::ValueDataSourceProxy< T >, RTT::internal::ConstReferenceDataSource< T >, RTT::internal::PartDataSource< types::carray< T > >, RTT::internal::ConstantDataSource< T >, RTT::internal::DataSource< T >, RTT::internal::DataSource< ProgramInterfacePtr >, RTT::internal::DataSource< DataSourceType >, RTT::internal::DataSource< SendStatus >, RTT::internal::DataSource< double >, RTT::internal::DataSource< SendHandle< Signature > >, RTT::internal::DataSource< A >, RTT::internal::DataSource< S >, RTT::internal::DataSource< CORBA::Any_var >, RTT::internal::DataSource< unsigned int >, RTT::internal::DataSource< types::carray< T > >, RTT::internal::DataSource< remove_cr< function::result_type >::type >, RTT::internal::DataSource< os::TimeService::Seconds >, RTT::internal::DataSource< arg_t >, RTT::internal::DataSource< remove_cr< boost::function_traits< Signature >::result_type >::type >, RTT::internal::DataSource< second_arg_t >, RTT::internal::DataSource< ds_type >, RTT::internal::DataSource< value_t >, RTT::internal::DataSource< ProgramInterface * >, RTT::internal::DataSource< bool >, RTT::internal::DataSource< StateMachinePtr >, RTT::internal::DataSource< boost::shared_ptr< ObjT > >, RTT::internal::DataSource< first_arg_t >, RTT::internal::ArrayPartDataSource< T >, RTT::internal::FusedFunctorDataSource< Signature, Enable >, RTT::corba::DataSourceProxy< T >, RTT::internal::PartDataSource< T >, RTT::internal::InputPortSource< T >, RTT::internal::ValueDataSource< T >, RTT::internal::ValueDataSource< ProgramInterfacePtr >, RTT::internal::ValueDataSource< ds_type >, RTT::internal::ValueDataSource< StateMachinePtr >, RTT::corba::AnyDataSource, RTT::scripting::DataSourceTime, RTT::internal::DataSourceCommand, RTT::scripting::DataSourceCondition, and RTT::internal::DataObjectDataSource< T >. Implemented in RTT::internal::ActionAliasAssignableDataSource< T >, RTT::internal::ActionAliasDataSource< T >, RTT::internal::AliasDataSource< T >, RTT::internal::FusedMCallDataSource< Signature >, RTT::internal::DataSource< T >, RTT::internal::DataSource< ProgramInterfacePtr >, RTT::internal::DataSource< DataSourceType >, RTT::internal::DataSource< SendStatus >, RTT::internal::DataSource< double >, RTT::internal::DataSource< SendHandle< Signature > >, RTT::internal::DataSource< A >, RTT::internal::DataSource< S >, RTT::internal::DataSource< CORBA::Any_var >, RTT::internal::DataSource< unsigned int >, RTT::internal::DataSource< types::carray< T > >, RTT::internal::DataSource< remove_cr< function::result_type >::type >, RTT::internal::DataSource< os::TimeService::Seconds >, RTT::internal::DataSource< arg_t >, RTT::internal::DataSource< remove_cr< boost::function_traits< Signature >::result_type >::type >, RTT::internal::DataSource< second_arg_t >, RTT::internal::DataSource< ds_type >, RTT::internal::DataSource< value_t >, RTT::internal::DataSource< ProgramInterface * >, RTT::internal::DataSource< bool >, RTT::internal::DataSource< StateMachinePtr >, RTT::internal::DataSource< boost::shared_ptr< ObjT > >, RTT::internal::DataSource< first_arg_t >, RTT::internal::FusedFunctorDataSource< Signature, Enable >, RTT::internal::InputPortSource< T >, and RTT::internal::DataObjectDataSource< T >. 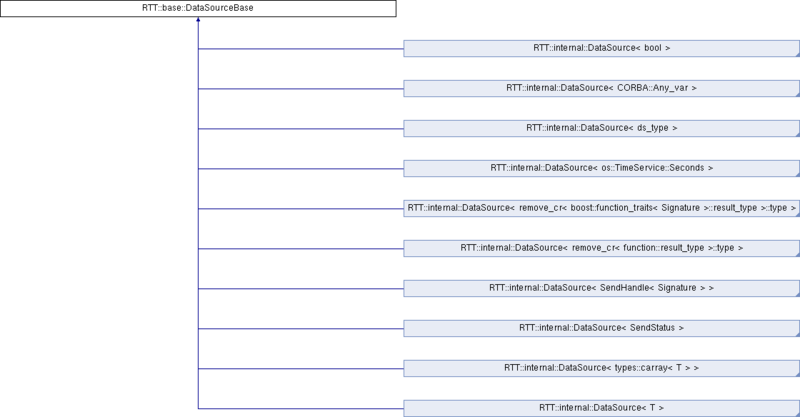 Reimplemented in RTT::internal::DataSource< T >, RTT::internal::DataSource< ProgramInterfacePtr >, RTT::internal::DataSource< DataSourceType >, RTT::internal::DataSource< SendStatus >, RTT::internal::DataSource< double >, RTT::internal::DataSource< SendHandle< Signature > >, RTT::internal::DataSource< A >, RTT::internal::DataSource< S >, RTT::internal::DataSource< CORBA::Any_var >, RTT::internal::DataSource< unsigned int >, RTT::internal::DataSource< types::carray< T > >, RTT::internal::DataSource< remove_cr< function::result_type >::type >, RTT::internal::DataSource< os::TimeService::Seconds >, RTT::internal::DataSource< arg_t >, RTT::internal::DataSource< remove_cr< boost::function_traits< Signature >::result_type >::type >, RTT::internal::DataSource< second_arg_t >, RTT::internal::DataSource< ds_type >, RTT::internal::DataSource< value_t >, RTT::internal::DataSource< ProgramInterface * >, RTT::internal::DataSource< bool >, RTT::internal::DataSource< StateMachinePtr >, RTT::internal::DataSource< boost::shared_ptr< ObjT > >, RTT::internal::DataSource< first_arg_t >, and RTT::internal::DataSource< T >. Definition at line 117 of file DataSource.cpp. Referenced by deref(), and ref().